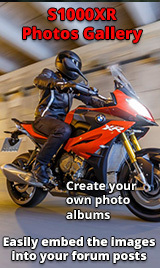 Hi all, here's the s1000XR accessory range brochure/PDF. Re: Hi all, here's the s1000XR accessory range brochure/PDF. Had to laugh. Had an Akrapovik slip on for the K1300S and it set me back a few pennies. They are asking $1200.00 for the can for the XR here in the States. Guess I'm going to find the sound of this stock can to be just perfect!! Hate to think of what they would want for the entire system!!!! Thanks - is the pricing for the accessories out there as well please?